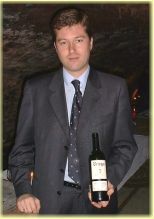 Gil Nunez, export director for Bodegas Briego, presented a selection of the estate’s wines at a tasting in the historic Edinburgh vaults of his UK agent, Raeburn Fine Wines (0131 343 1159). The wines of Briego span six levels, from the Tinto Roble, aged for only a few months in oak and made in a fruit-driven, modern style, to the more classically constructed single-vineyard “Fiel” Gran Reserva, which spends five years in a combination of oak and bottle before release. This is a family-owned business, brothers Fernando, Gaspar and Javier having established Briego only in 1988. The estate is based around much older vineyards which cover around 30 hectares in the Duero. Though in the family for many decades before, the estate had fallen into disuse before the brothers’ decision to revive it. 1992 saw the first vintage of Briego’s Ribera del Duero, made from selected Tempranillo grapes and aged in various combinations of steel and American and French oaks. I found these to be a really terrific set of wines overall: this is an exciting new estate for me. Each of the wines shows excellent structure, with quite a reserved, savoury character at their core. These are fairly ‘serious’ wines, particularly at Reserva level and above, and seem to be built for substantial cellaring potential with good balance and powerful tannins. The tasting was not blind. The beautiful but dark setting of Raeburn’s 12th century vaults made colour assessment very difficult. Prices shown are retail prices from Raeburn Fine Wines, in pounds Sterling (approx £10=$15US). Gil thinks the 1999 vintage is probably the best in Ribera for a decade, so it will be interesting to taste the Crianzas and Reservas when released. This wine spent six months in new American oak, and is made from vines of around 10 to 15 years of age. It has a deep, creamy, sweet cedarwood nose that is spicy and rich, with plenty of earthy fruit. There is a nice quality of fruit on the palate, which is quite firm with a drying tannic edge, suffused with spicy oak. Quite a serious style though made for drinking now, and very good. This comes from vines with a slightly older average age, and spends 10 months in new American oak, before finishing for another four in French Alliers oak. It is three-years old on release. It has a wonderfully ripe, full nose of cedar, toast and rich, sweet berry fruits. The palate is elegant, with a silky texture and a hint of minerality. There is plenty of sour cherry fruit, a firm blackcurrant quality. Drying tannins, a liquorice quality, and some firm acidity grips the finish which is long and spicy. Very good. Lovely sweet, floral, even perfumed nose. Much less overt oak, with hints of liquorice and black cherry. Very elegant on the palate again, with silky tannins, red cherry and black fruits. Some tight acids and tannins have the finish in an uncompromising grip at present. Very classy, and very good. This wine is available in very limited quantities. The vines for the Reserva wines are between 30 and 50 years old. Grapes are picked late, usually well into October, and the wine is aged for around 11 months in new American oak, with a further eight months in Alliers. This has a gloriously rich, berry-scented nose, layered with charry oak, toast, caramel and spices. The fruit quality is very lush. It has beautiful silkiness on the palate; a really lovely texture, and round, quite fat and generous fruit with heaps of sweet blackberry, damson plum and fine tannins. Good balance again, and excellent. Focused, tight, sweet nose of fudgey oak and a baked cherry pie quality of fruit. On the palate it is rather tight and sinewy, with a muscular framework of tannins and concentrated fruit that lacks the silky quality of the 1995 and the Crianzas at this stage. It has fine fruit and good balance however, so I would expect it to evolve very nicely given a few years. This was very recently bottled, and had not been shipped at time of tasting. Slightly odd plasticine quality on the nose and tight, subdued fruit. The palate is shot through with bright cherry fruit, but also a certain astringency. There is depth here, and an underlying quality of fruit, but the finish is clamped by tannins and it is tough to judge on this showing. I would need to re-taste to give a firm evaluation. This is the single vineyard Reserva made from 50-year old vines and a second selection of grapes (grapes for all cuvées are sorted in the vineyard, then re-sorted in the bodegas for this bottling). It spends 12 months in American oak, and 10 in Alliers. It has a really fine, elegant nose. It is suffused with sweet, ripe, beautifully focused fruit. There’s a violet aromatic note and loads of tight, sweet blackcurrant. The palate is savoury and juicy with a complex mineral core, good sweetness of ripe black fruits and silky-fine tannic structure. Balanced acidity and good length. Excellent. Similar selection to the Reserva, with more of the balance (14 months) of the ageing in new French Alliers oak. This was also a wine not yet shipped at the time of tasting. The nose is quite closed at first, with dark scents of polished wood, mulberry and dense, dark fruit. There is cedary oak, clove and a muscular, compact feel. On the palate a lovely concentration of black fruit but much is hidden behind a veneer of oak, tannins and acidity. Obvious structure here and balance, and a terrifically promising wine. Excellent.